Lessons identified in Crimea – does Estonia‘s national defence model meet our needs? The annexation of Crimea in late February 2014 raises a number of questions about whether Estonia’s own national defence system is adequate. The military part of the national defence development plan approved last year states that Estonia can only benefit from units that consist of trained personnel and possess the specific equipment and weaponry they require. Given the events in Crimea, we can of course only concur with the planners, but do the core elements of Estonia’s military national defence system meet the current needs? It took very little time for the forces of the Russian Federation to occupy strategic sites in Crimea. At 4:00 AM on 27 February 2014, Russia’s president Vladimir Putin gave the order to launch an exercise on the Black Sea involving 36 ships and 7,000 troops. In the hour that followed – starting around 4:00 AM local time – about 30-50 Russian special forces members entered and occupied the parliament and government buildings of the Autonomous Republic of Crimea. There should have been a swift response to the developments in Crimea. Indeed, had the Ukrainian leadership acted rapidly and forcefully, utilising the forces at its disposal, the advances made by Russian special forces could have been hindered and possibly halted. Unfortunately, such orders never even reached the military structures. In the 20 hours following the order to launch exercises on the Black Sea, Russia was capable of seizing three strategic sites on the Black Sea, using approximately 150 special forces personnel. After 40 hours, about 2,200 special forces units and airborne troops had been deployed. The first news that the parliament and government building had been occupied mentioned only “armed pro-Russian individuals” and this made it more difficult to take adequate measures. The military victory was clinched. The Ukrainian leadership and the rest of the world had been presented a fait accompli. Throughout its invasion of Crimea, Russia counted on two key factors to minimise the risk of bloodshed among its own forces and maximise the chances for success: (1) A brand new Ukrainian central government in disarray; and (2) No prospect for a military response by NATO. How would Estonia have fared in a similar situation? If we put Estonia in the same place as Ukraine, what would have been Estonia’s chances of adequately responding? Above all, an attack would, similarly to Crimea, focus on airfields and harbours that would make it possible to rapidly deploy additional forces into Estonia, as well as on local government institutions, which would have more of a political role. Unlike Crimea, forces can also be deployed and fanned out across the country using the southeastern Estonian road network. The mobilisable reserve forces form the main bulwark of Estonia’s military defences. The primary role of the Estonian Defence Forces in peacetime is to prepare reserve units by training conscripts and reservists. Less emphasis is laid on training professional units and sub-units manned by members of the voluntary defence organisation Kaitseliit. In Estonia, conscription is currently organised as a training cycle repeated at regular intervals. Units manned by conscripts that have completed their training cycle do not remain on active duty. Conscripts are assigned to the reserves and sent home. To this point, it has been considered a sound practice because since the 1990s, the Russian armed forces have been considered to have their hands full dealing with internal problems. Thus Estonian defence planners assumed that the security environment would deteriorate only gradually, allowing the country’s political and military leaders time to calmly prepare and procure more ammunition, mobilise reserve units and carry out additional training. Today it is obvious that the general security situation has grown significantly worse. Should a Crimea scenario arise, the Estonian Defence Forces would not have time to mobilise reserve units. Moreover, there would be no point in pitting conscripts with only limited training against Russian special forces who would already have seized and taken up defence of sites of strategic importance. If we analyse the dates when conscripts are called up for compulsory military service in 2014 and the number of conscripts, we see that only in the first five months of the year there are significant number of conscripts who would be capable of operating at least on a platoon level. The Defence Forces also have a smaller contingent consisting of rapid-response units (above all, the Scouts Battalion and also a special operations unit) manned with active duty personnel. In recent years Kaitseliit has increased its membership at a stable pace and as of the end of 2012, the organisation had around 13,200 active members.Yet caution should be exercised in using this number, because all active members do not belong to units that have trained together, although their commitment to defend their country can be assumed to be high. According to the new national defence development plan, Estonia’s military defence capacity will grow significantly in the decade ahead. Larger numbers, however, do not necessarily ensure sufficient security in a situation where a highly capable enemy is acting decisively. An attacker may intentionally sow doubts as to whether the country has fallen victim to aggression or whether it is merely a criminal group that has managed to occupy a building. This “fog” may cause mobilisation to be put off so long that the adversary could occupy key sites and thereby make mobilisation difficult, if not impossible. The deployment of allied forces to Estonia before or during a possible military attack is one of the most important aspects of NATO membership. The main value of belonging to the alliance lies in military deterrence through all members’ commitment to collective defines under Article 5 of the North Atlantic Treaty, which should lead potential adversaries to abandon the idea of military aggression in the first place. But if a Crimea-type, “creeping” invasion scenario involving special forces should come to pass, Estonia would have very limited immediate support from the allied units. The NATO Air Policing Mission, even with its recent strengthening in response to Russia’s invasion of Ukraine, would offer primarily symbolic support. The key deterrent is therefore deployment of NATO ground troops to Estonia – either permanently or by prepositioning equipment, allowing the units’ personnel to be deployed relatively quickly if a crisis develops. A new aspect seen with regard to Russia is its ability to incite revolts and unrest on foreign soil while rapidly deploying military forces to aggravate and exploit the resultant political turmoil. The question is about what measures Estonia could implement to allow it to respond immediately and forcefully to military aggression. On the national level, the transition from peacetime to wartime must be seamless and ensure continuity of leadership. Command exercises must be regularly held for Estonia’s political and military leaders. The responsibility of every government agency should, as a crisis deepens, remain as little changed as possible, without complex and risky transitions. The simplest and most logical move is to base all activities that take place across all agencies in both peacetime and wartime on a uniform set of principles. Estonia will always be unable to win a war of sheer numbers against its eastern neighbour, so it must focus on quality. This will require units in a high state of readiness, fully manned, well trained and equipped. The question facing Estonian defines planners is therefore whether the Defence Forces in the future should focus on reserves or on ensuring the existence of highly capable units that can be used immediately. The events in Crimea show that the latter should be a priority. Undoubtedly radical measures should be considered, such as increasing the number of units manned with active duty personnel. Another possibility is to extend the duration of conscription so that the units that are trained during compulsory military service are not immediately assigned to the reserves but instead left on active duty for a time. This is the option being explored in Norway, where an 18-month term of service is being attempted that would allow conscripts to be used for up to six months. Kaitseliit, too, should include sub-units at a high state of readiness, with a training level and equipment that allows them to be used against an opponent’s elite units. In parallel to Estonia’s efforts, its NATO allies should be asked to increase its presence in the Baltic States, one that goes beyond NATO’s current Air Policing Mission. In the light of Russia’s aggression against Georgia and Ukraine, the lack of a NATO military presence in a state neighbouring Russia appears to provide an incentive for Moscow to consider using force to pursue political objectives. Thus, the permanent stationing of NATO ground units and/or prepositioning of equipment in some of the Baltic States could be of critical importance to deterring potential aggressors in coming months and years. The article is adapted from the analysis originally written for the International Centre for Defence Studies in Tallinn. 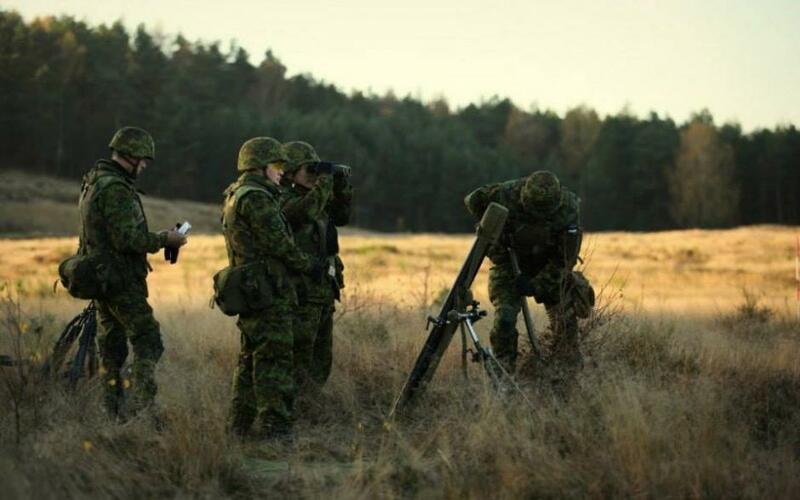 Cover photo: Estonian soldiers on a training/Courtesy of the Estonian Defence Forces. Martin Hurt is the Deputy Director of the Tallinn based International Centre for Defence Studies where he has worked since 2010. He has previously worked on various posts at the Ministry of Defence of the Republic of Estonia, the General Staff of the Estonian Defence Forces and the Headquarters of the Swedish Armed Forces. His responsibilities have included national defence planning, budgeting, real estate management and defence procurement.